Training myself mentally will most likely serve me far better than attempting to train myself physically. The best physical training for a big cycle tour is to ride a really heavy bike a really long way. Obviously. Guess what? We are going to do that by going on a big cycle tour. We will start off gently and hopefully in a few weeks we will most likely be as fit as we need to be. The nice thing about our tour is that we have no set schedule and our days are not planned. We don’t have to be ready to ride 80 miles everyday the first week. This is good because we live in Michigan, and it can prove to be difficult getting much training miles in due to the weather. If we were going with a group and a set schedule intense training would be critical, but we plan on easing into it. That being said we do have a goal to get in 500 miles before we leave. This gives us a chance to try out our rain gear, our snow gear, our tires. We have been lucky enough to have a few warmer weekends this spring and we have been taking advantage . In fact, todays high will be 32 degrees and off we go in a few hours. We get to try out our merino wool long underwear!! I think mentally preparing to live on the bike will prove to be the most beneficial and crucial thing we do. Preparing to be wet and cold for days at a time. No showers, less than clean hotel rooms. This is probably worrying me more than I think, but I am going to try to train for that too. Experienced bicycle tourists usually say the highs are super high and the lows are really low. 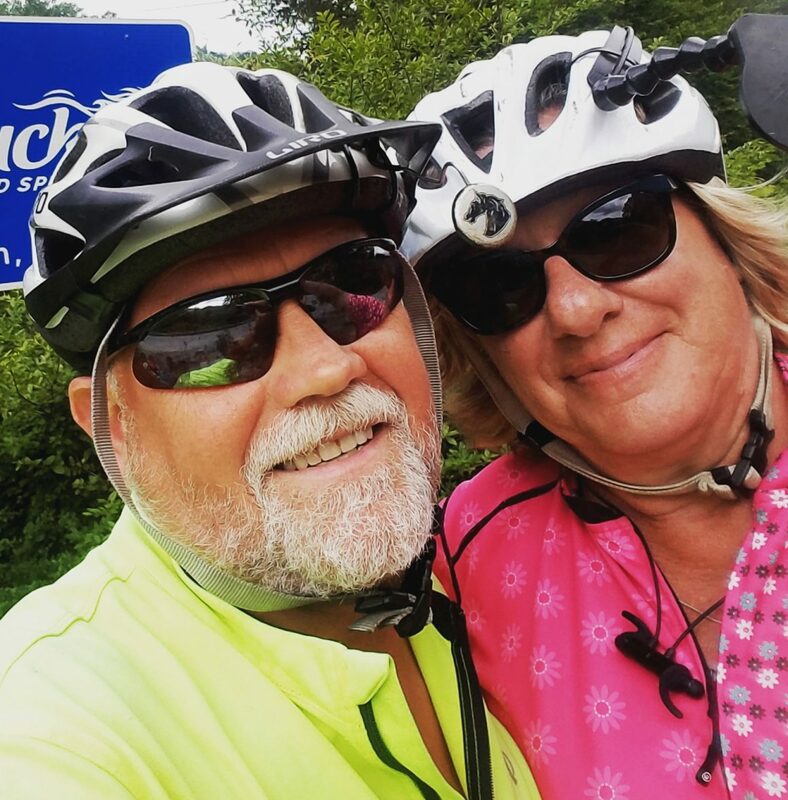 Mike and I have experienced this many times in our previous bike trips, but we travel very well together and often prove to be our own great support system. In fact Mike is usually so chipper on these rides I often tell him to go ride ahead to leave me be miserable in peace. in an effort to prepare myself mentally I’ve been working on a few things. Being as prepared as possible will most likely make for a more enjoyable ride and hopefully ease my mind so I can totally enjoy the experience. ease off social media. I love politics, I’m addicted to news. I’ve been working on distancing myself from my need to always be connected. we’ve been saving money like crazy so we can afford to sleep in cheap hotels and eat in diners along the way. We will have our camping gear, but after a long hot day in the saddle I love to know I can sleep in an air conditioned room and have a hot shower. This is more important to me then to Mike. but I’m not sure I would do this if I had to camp every night. I got my hair cut shorter so I can just wash and air dry it. Not all of you will understand the importance of this, but it is a big deal to me. My hair is hot and heavy. we have purchased the best gear we can afford. Comfortable clothing, good saddles, bikes we love. we have given ourselves plenty of time. This ride can be done in 60 days, but we’ve allowed ourselves 4 months so we can truly enjoy the scenery and stop when we like. Studio JSD..fascinating class with new friends. Sweater knitting! I love winter projects. I am not sure why I received this 2 inch thick forestry catalog in the mail but I’ve just spent an enjoyable three hours catching up on the latest gizmos for foresters. I shoulda been a forester.